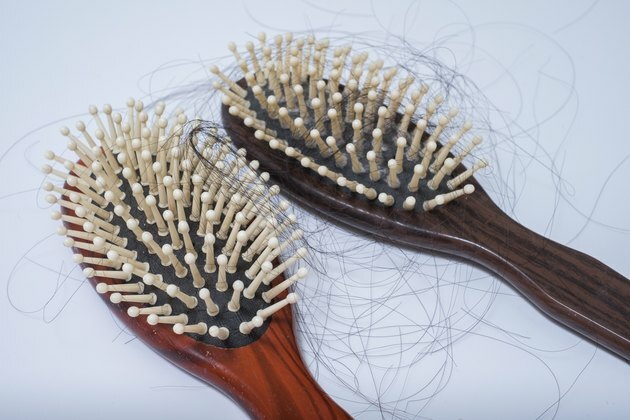 If your hair suddenly begins to fall out -- especially if you're a woman or if you're a man whose hair isn't following the established contours of male pattern baldness -- it can be tough to determine why. You probably wouldn't think to consider your digestive system as a potential cause of this hair loss. But celiac disease -- a digestive condition involving your body's reaction to a protein called gluten found in certain grains -- carries links to a type of hair loss called alopecia areata. In addition, celiac disease can cause iron deficiency, which may be linked to hair loss. Celiac disease, a genetic condition, occurs when your body reacts to consumption of gluten by triggering damage to your small intestines. Because this intestinal damage means you can't absorb nutrients well, people with undiagnosed celiac disease often suffer from iron deficiency, along with other vitamin deficiencies. To treat celiac disease, you must eliminate all sources of gluten from your diet, which means you'll need to avoid everything containing wheat, barley and rye -- the three gluten grains. Almost all conventional baked goods and many processed foods contain one or more of those grains, making the diet challenging to follow. Like celiac disease, alopecia areata represents an autoimmune illness, meaning that your body's own immune cells cause the damage -- intestinal damage in the case of celiac disease, and hair loss in the case of alopecia areata. People with celiac disease suffer from higher rates of alopecia areata than the general population, and a few people with alopecia areata have undiagnosed celiac disease. In fact, a study published in 2009 in the medical journal "Digestion" found that around 2 percent of newly diagnosed celiacs also had hair loss stemming from alopecia areata. Many also had iron deficiency, although it's not clear if that was related to their hair loss. It's possible that iron deficiency plays a role in otherwise unexplained hair loss in the absence of celiac disease, but research into this question has produced mixed results. In a study published in 2008 in the "Dermatology Online Journal," researchers looked at iron levels in patients with hair loss, and compared their iron levels to those in healthy controls. They did find slightly higher levels of iron in the control group when compared to the hair-loss group, but the differences were not significant. They concluded that iron deficiency may play some role in hair loss, but probably not a major one. If you're experiencing unexplained hair loss and your dermatologist diagnoses you with alopecia areata, you should consider getting tested for celiac disease if you have any of the symptoms. These can include gastrointestinal complaints, fatigue, insomnia, rashes, infertility and depression. If your testing shows you do have celiac disease, following a strict gluten-free diet may help you reverse your hair loss. Still, since hair loss often reverses on its own in patients with alopecia areata, you may never know whether your diet helped or not. However, sticking with a gluten-free diet also can help people with celiac disease improve their iron stores and avoid other health problems, such as osteoporosis. Celiac Disease Center at Columbia University: What Are CD and DH? Can You Wash Your Hair Every Day After the Brazilian Keratin Treatment?